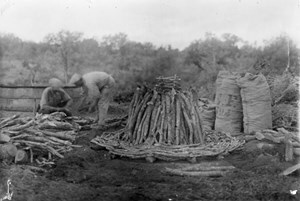 The making of a wood pile in Cadarache. 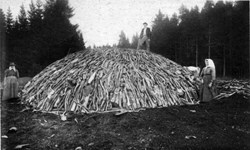 Note the arrangement of branches at the heart of the pile. This is the central shaft that will serve as an air duct. The quest for energy goes back a long way in Cadarache. Long before the CEA nuclear research centre was established, men toiled in the deep and vast forest to produce a fuel of highly calorific power which they obtained by slowly "cooking" hardwood in the absence of oxygen. Charcoal is among the purest forms of readily available carbon. Because it burns at intense temperatures of up to 2,700 degrees, it was for centuries the fuel of choice for the blacksmiths' forges, the glassmakers' and lime-burners kilns, and the ironmasters' furnaces of nascent industry. From the Middle Ages until World War II, charcoal-makers, or "colliers," were familiar—although vaguely frightening—figures in the forests of southern Europe. Villagers were uncomfortable with their blackened faces, strange eating habits (didn't they feast on snakes and foxes?) and deep knowledge of the forest's secret resource. Villagers associated their craft, so closely linked with the mastery of fire, to the Devil's work. Colliers, however, played an essential role in the development of local industries. In the 17th century, charcoal produced in the forest of Cadarache was burned in the kilns of the local glassworks, whose remnants were identified by archaeologists on the edge of the ITER site in the area where subcontractors now have their portacabin offices. In the 1920s, some 50 charcoal-making families, most of them Italian immigrants from Piedmont and Bergamo, lived deep in the 2,200 hectare-forest. What they produced was sent all the way to Marseille to be used in furnaces and also as filter to purify drinking water. 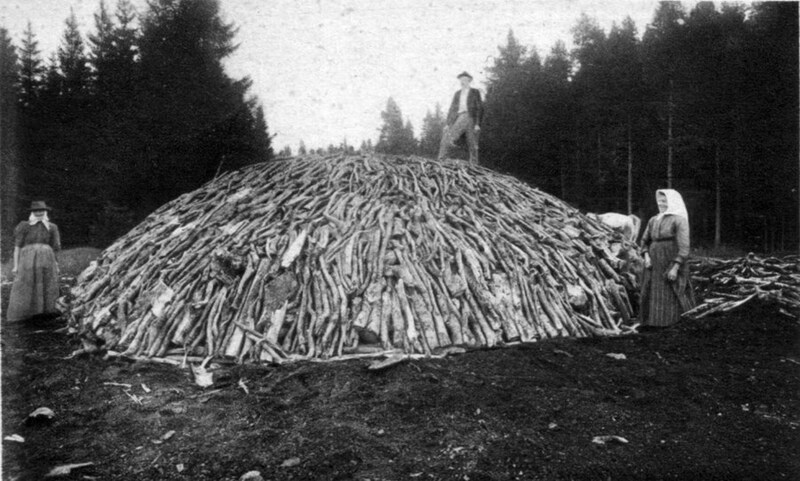 Once covered with turf and leaves, charcoal piles (here circa 1890) could contain 20 to 30 tonnes of wood and rise several metres high. The largest ones could burn for more than 30 days. "You can still see the traces left by the colliers' wood piles," says Alain Savary, the local National Forestry Commission (Office National des Forêts) representative and ITER's closest neighbour. "They are like perfectly circular clearings, some 15 metres in diameter. Nothing grows there: the soil underneath is totally burnt and sterile." In his Maison Forestière, the large Forest Ranger's house he inhabits right across the road leading to the future Headquarters building, Savary has preserved some of the memories of the colliers of Cadarache forest. This steam machine (circa 1930), operating at the ''Maison Forestière,'' right across the road from the future Headquarters building, was probably used to produce motor engine fuel from charcoal. 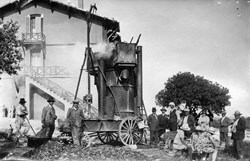 Charcoal production in Cadarache seems to have ceased in the late 1940s, after a short revival during World War II. Motor engine fuel was scarce then, and charcoal was widely used in wood-gas generators to power private cars, buses and even tractors. From approximately fifty thousand tons a year in the late 1930s, wood and wood charcoal production for such vehicles, called gazogènes, increased to almost half a million tons in 1943.